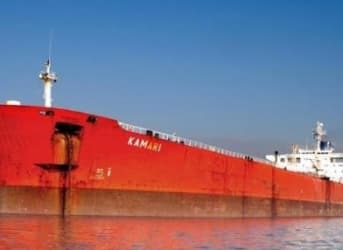 An Iraqi Kurdish crude oil tanker has been seen floating off the coast of Israel after offloading its cargo, ship tracking data has shown. If true, the transaction would be in open defiance of Baghdad, with whom Israel has no diplomatic or commercial relations. Furthermore, any commercial transaction between an Arab country and Israel violates the ruling of the Arab Boycott Bureau that bans all commercial exchanges with the Jewish state. But it would not be the first time that Kurdish oil has found its way into the Israeli market. Iraqi Kurdistan, although autonomous, is still in principle supposed to conduct its oil transactions through Baghdad. Selling into the oil market directly and independently of Baghdad provides the Kurds in northern Iraq with much needed funds. It also helps the Kurds move away from Baghdad and toward independence, which it has made no secret of wanting. This is something that none of Iraq’s neighbors are happy to see, as they each have their own Kurdish minorities who might be tempted to try and follow their Iraqi brethren down the road to independence. Turkey, of course, has a very large problem with its own Kurdish population, as do Syria and Iran, to a lesser degree. This recent development adds yet another headache to the Iraqi government’s list of monumental problems, starting with the loss of a huge chunk of its territory and authority to the Islamic State, which has declared a new Islamic Caliphate created and managed by a self- proclaimed caliph. At this point in time, it’s impossible to identify the Kurdish oil’s destination or buyer. A previous delivery of oil from Iraqi Kurdistan occurred last June. While some Arab countries do maintain commercial exchanges with Israel, albeit very discreet ones, officially at least, the Arab world for the most part continues to shun Israel. The Kurdistan Regional Government (KRG) has in the past denied selling oil to Israel “directly or indirectly.” They have not commented on news reports of the Israeli shipment. There have also been numerous rumors in the past of a number of transactions between the Kurds and Israel. Israeli Prime Minister Benjamin Netanyahu and several other high-ranking Israeli officials have even publicly expressed support for an independent Kurdistan. Iraq's central government in Baghdad has repeatedly called independent Kurdish exports "smuggling," saying only state marketer SOMO has the right to sell Iraqi oil. The KRG says the Iraqi constitution allows it to sell oil independently. Angered by the reported sale of oil to Israel, Baghdad has tried repeatedly to prevent the KRG from selling oil to Israel and has cut the Kurds’ budget allotment as punishment. The Kurds have been asking Baghdad to release the funds, which are needed to help in the fight against the Islamic State. Ship tracking data indicates that the Kamari, the oil tanker in question, switched off its satellite transponder on Aug. 17. Two days later, it reappeared on radar close to the Israeli shore. More than 7.5 million barrels of Kurdish oil have flowed through the independent pipeline connecting northern Iraq to the Turkish port of Ceyhan. Turkish officials and industry sources said the capacity of the Kurdish pipeline has been upgraded to 200,000 barrels per day (bpd) and there are plans to increase it to 250,000 bpd soon. The Iraqi government has already succeeded in stopping one tanker from reaching its destination; the United Leadership has been idling off the coast of Morocco for almost three months. Lets not forget the tanker sitting in the gulf of mexico. but of course. thank you for pointing it out.